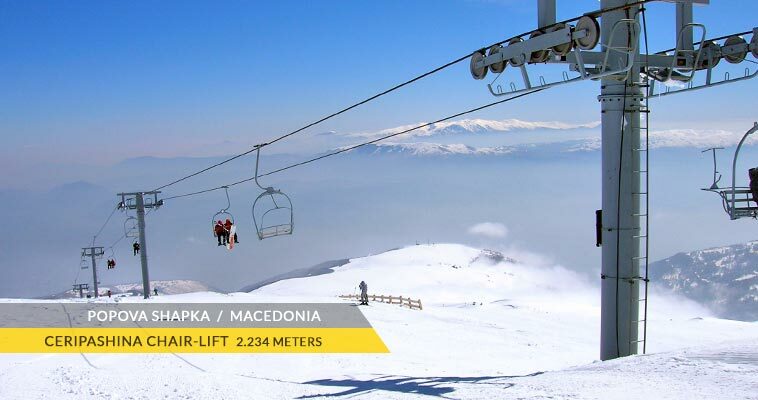 High above Tetovo on the Sar Mountain, there is the Popova Sapka ski resort (Popova Šapka, Popova Shapka), a major winter destination in north-western Macedonia. Popova Sapka is part of the wider Tetovo region and minucipality. Popova Sapka is just the ski resort, a district including Popova Sapka hotels and other accommodation, a refuge (called Smreka) & the weekend settlement that rises on the opposite side of the ski slopes & lifts. The Popova Sapka ski resort, represents the most visited tourist destination allover the Tetovo region. The road is in the middle between the settlement and the ski terrain, that rise up on the opposite sides. The resort Popova Sapka can be accessed by the local road from Tetovo (18 km) and on to Skopje (48 km). The ski slopes in Popova Sapka are first class & start at 1,690 meters above the sea level. They are connected by chair and drag-lifts. Popova Sapka is home of military base of the Macedonian Army & meteorological station. According to certain sources, a legend exist, how this area of Sar (Shar, Šar) Planina was named Popova Sapka (Popova Šapka). The legend says an orthodox priest exerting the evangelical mission, was killed like a martyr (and the body remained to be torn asunder by the wild animals), while visiting the orthodox-macedonian homes through the villages. At this district, where only the priest's hat (on macedonian "kamilavka") was found - was named in his honor, Popova Sapka (English - Priest's Hat).